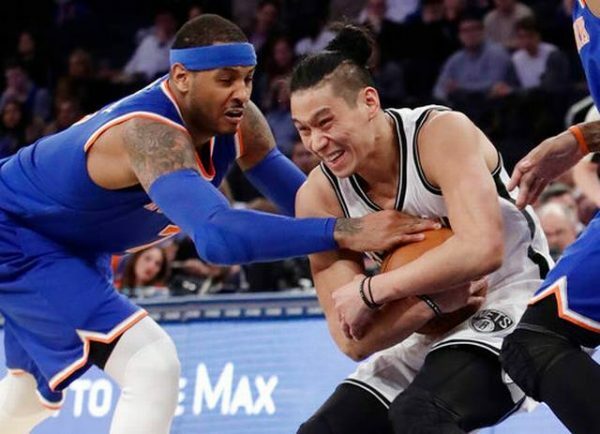 For the second time in less than a week, the Brooklyn Nets beat the New York Knicks, this time in the Madison Square Garden. The 121-110 victory was the Nets 13th win this season and their fourth since Jeremy Lin came back from injury in late February. Lin finished with 15 points and 8 assists. He had a rough shooting night (5-for-16 from the field, 2-for-9 from beyond the arc). He played 30 minutes, his first 30-minute game since December, and added 4 rebounds and 2 steals while finishing with a +14. Lin is averaging 16.2 points per game in March, and his per 36 scoring is at 24.3 points. Brook Lopez scored 24 points and Rondae Hollis-Jefferson added 20 points in just 25 minutes. The Nets didn’t have Trevor Booker to help from off the bench, but there was no real need for it. The entire starting lineup finished in double figures; Caris LeVert finished with 13, Randy Foye had 10 points. On the other side were the sad looking Knicks, drifting even further away from a playoff spot. Mathematically, the Knicks are still in the playoff picture. Realistically, they’re not going to make it, which means 4 years in a row out of the playoffs. Derrick Rose led the Knicks with 22 points (8-for-9 from the line), while Carmelo Anthony had a poor shooting performance to finish with 17 points; he shot 0-for-6 for three, 7-for-17 from the field overall. The Knicks shot just 18.8% from beyond the arc. The Nets have a chance of grabbing some more headlines on their second half of the back to back. They begin a four-game homestand by playing the Boston Celtics. A win here would make a big difference in the playoff race, and the good news for the Nets is that Isaiah Thomas won’t be playing. There’s nothing serious holding him back, but his knee injury is enough for the Celtics to decide they’re leaving him home for their two next road games. The Celtics have enough of an advantage when it comes to their personnel to still be favorites against the Nets, but Brooklyn and Lin (who won’t have to chase Thomas on defense) have an opportunity to affect the playoff race. Despite an off-night in terms of shooting percentage, Lin playing 30 minute is another small step forward. A strong finish for this season won’t help the Nets hide their abysmal record, nor will it make up for Lin missing such a huge chunk of the season. But with the Nets outside the realms of tanking due to their draft situation, the opportunity for some growth, enjoyable basketball and even some wins, is well within reach. Too bad they don’t play the Knicks anymore.